So I’m bringing back my series Mirror Mirror to Glasstire which was named in honor of its first posting and dedicated to all the multitasking, multi-talented, and multimedia artists who deserve a little shout out for their various incarnations. Mirror Mirror #7 presents HOMECOMING!, an experimental art collective based in Fort Worth, Texas that is as dynamic as it is energizing. Launched in December of 2011 and sparked, perhaps ignited, by the return of Bradly Brown from NYC, HOMECOMING! 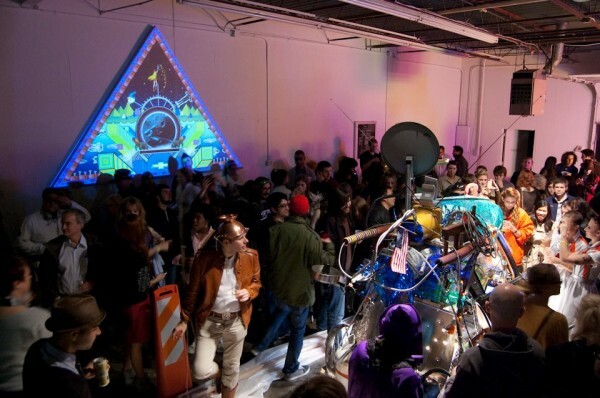 began as a convergence of minds (Brown, Kris Pierce and Gregory Ruppe) who had all known each other in Denton and witnessed first hand the Good/Bad Art Collective’s notorious events that happened over eight years ago. Together the three recruited thirteen artists who were interested in working collaboratively in addition to their own individual art practices. Artists interested in happenings as ephemeral moments rather than tangible and permanent objects. HOMECOMING! hopes that through shared experience they can “transform the ephemeral into the tangible.” As far as work distribution, HOMECOMING! says it can sometimes be tricky. As a fairly new collective, they are open to trying out individuals… Lucky for them it has worked out in their favor as the people they really want to work with, work hard and have stuck around so far. Hands on an Art Body: Terri Thornton 2012 from HOMECOMING! on Vimeo. Hands on an Art Body is inspired by the 1997 documentary Hands on a Hard Body in which twenty-four contestants competed in an endurance and sleep deprivation contest to win a brand new Nissan Hardbody truck. The hook: just place your hands on any work you desire in the gallery. The line: master of ceremonies Richie Budd will be serving shots of ”de-gold” schlager from his recent performanceSchlager at the Triangle Arts Association in New York. The sinker: remain there with your hand on chosen artwork throughout the evening until you are the last one standing. HOMECOMING! promises it “to be a test of your endurance, stamina, mental focus, and bladder control”. The last participant left in contact with the art at the end of the night acquires the work. Warning the participants will “endure bizarre installation, social deprivation, and artwork that is designed to resist the contact of the viewer”. Unlike most gallery closings this exhibition will give ownership of work not to the highest bidder, but to the individual who displays the greatest will and determination. HOMECOMING!’s system of acquisition seemingly devalues the object through constant contact but to those persistent contestants its worth will only increase as the moments of competition and desire tick away. You can make an appointment to preview the work up for grabs from May 12th – 18th or go to the gallery the night of the closing reception from 6pm- 9pm before the start of the competition. During this time, those wanting to compete for work will need to register and be briefed before the official start. According to the press release “referees, coaches and cocktail waitresses will be on-hand to mediate and assist contestants”. The competition will continue until each work is left in contact with only one triumphant contestant. Whether that’s hours, days or weeks, HOMECOMING! and what I’m assuming will be an enthusiastic audience thinks your up for the challenge. So what’s up next for HOMECOMING!? Look for them to be curating a series of guerilla style video shows called In-Transit through the summer of 2012. Hands On an Art Body runs May 12th-26th at Oliver Francis Gallery. Reception: May 19th 2012, 6pm –?